Taking good care of your Jack Russell puppy early on, will give him a good start in life. If you brought a new puppy home, or thinking of getting one, you'll find valuable puppy health tips from a Jack Russell breeder here. Download and print tips to help you get through the first few weeks. Adobe Reader required to open PDFs. PLEASE NOTE: Before installing, we recommend that you remove the check under "Optional offer" for McAfee. Available from various bookstores including Exclusive Books. For a reputable puppy school in your area, visit puppyschool.co.za from Hill's. Alternatively you can ask your vet. 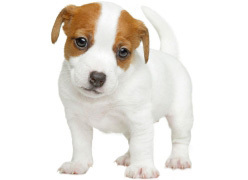 Your Jack Russell puppy should eat a balanced diet 2-3 times per day. A good quality dry food provides all the nutrients the puppy needs. At 6-7 weeks of age, Jack Russell puppies are totally weaned. It isn't advisable to leave food out all day. Remove food that isn't eaten within 15-20 minutes. Introducing new food can upset your puppy's stomach, so do it gradually over a 5-day period if the need arises. Porridge, cow's milk and other human food isn't healthy for puppies. You may give nutritious treats & hooves. When puppies start exploring their new home and garden, their tummies often get upset and watery when they chew on treats and plants that are all new to them. This is mostly not serious and can be treated very effectively with Protexin Soluble which is available from your vet. However, if the puppy loses appetite or seems listless and sick, rather take him to your vet. Protexin Soluble is a multiple-strain probiotic powder, a biological product which helps to ensure a beneficial balance of digestive tract micro-organisms. It builds the immune system and can be given every day as a maintenance supplement if desired. It has a sweet taste. 1 teaspoon, 2 - 3 times daily, over wet or dry food OR sprinkle it directly onto the tongue by dividing it into smaller portions and administer with a small teaspoon. Allow pup to swallow without choking on the powder. Puppies need to be vaccinated in due time, to minimize the effect of the most common and some highly contagious deceases that causes death in young dogs. A special vaccination, the "Puppy DP" against Canine Distemper and Canine Parvovirus, which is optional but advisable, should be given at 4 weeks of age. The normal "6 in 1" vaccination should be given at 6 weeks of age against Canine Distemper, Parvovirus, Canine Adenovirus type 2/Contagious Hepatitis, Para Influenza Virus and Carona Virus. It is necessary to take your puppy to the vet to receive booster vaccinations at 10 weeks, 14 weeks and annually thereafter. Worms and intestinal parasites in dogs can seriously affect its immunity against viruses and diseases. All your dogs should be dewormed at least twice a year. Puppies tend to get infected by intestinal parasites easily, which inhibit proper growth and development. The pregnant and lactating female should be dewormed regularly, to prevent her from spreading parasites to her unborn. Puppies should be dewormed every 2 weeks until 6 weeks of age, to ensure that you get a puppy free from parasites and worms. When searching to buy a Jack Russell puppy, ensure that you buy from a reputable Jack Russell breeder with bloodlines that are free from eczema. In addition, it is best to avoid certain "triggers" of eczema, especially when your Jack Russell puppy shows signs of a red, itchy or flaky skin. Other signs of eczema may include the paws becoming raw on the cushion and between the toes. It seems like the pure South African bred Jack Russells battle more with eczema than those bloodlines that are from Australia and New-Zeeland. In severe cases of eczema the dogs continually need stronger doses of cortisone and anti-biotics, because the body adapts to regularly given medication, and the symptoms will soon re-appear. The problem with this kind of treatment is that the cause of the eczema is never properly diagnosed, only the symptoms are treated. Wheat – in dog biscuits, rusks, bread and pasta. Cheap dog food – the cheaper the food, the more fillers which can cause allergic reactions, also bigger and smellier pooh in your garden!! Shampooing too often – this is stripping the skin of natural oils. Traces of washing powder – that stays behind in the bedding. Feed a good quality, Omega 3 enriched food, and clean water only. Supplement with 1 x 1000mg Omega 3 capsule daily. Give whole capsule to chew, or cut open and empty out the oil over food. Omega 3 capsules for human consumption is good and cheaper than the veterinarian's. Eliminate ALL wheat from the diet.